Areas of expertise: Wildlife co-existence, reducing human/bear conflict, and electric fencing. Russ joined Defenders in 2012. He is based out of the Missoula field office, working directly with landowners and management agencies while managing the Electric Fence Incentive Program and the Yellowstone Bison Coexistence Project. 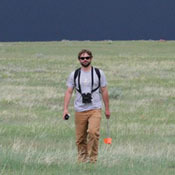 He also lends support to various field coexistence projects for black footed ferret, fisher, wolverine, bison and wolves. Prior to joining Defenders, Russ worked for 6 years on bear management and research with the Wind River Bear Institute and Montana Fish, Wildlife and Parks. He has experience promoting applied conservation in Minnesota, Idaho, Montana, Wyoming and Canada. He attended Colorado State University and later the University of Montana, where he earned his B.S. in Wildlife Biology and a B.A. in Psychology.